You can't take breathing for granted in swimming. Beginners tend to lift their heads above the water when they run out of air and gasp for more. But breaking your rhythm while swimming slows you down and tires you out, so incorporating breathing into your stroke cycle is an essential first step to improving your aquatic skills. 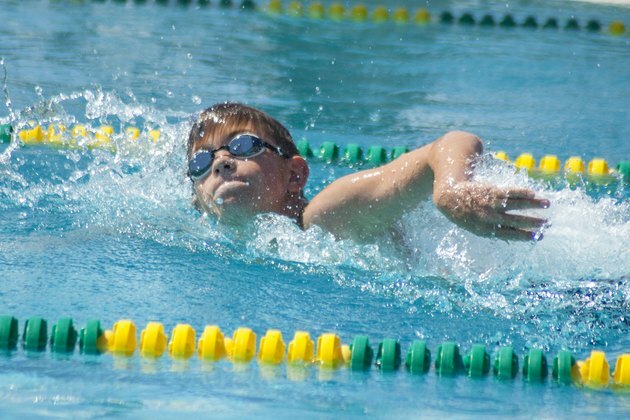 Freestyle is the fastest of all four competitive strokes and is the one fitness and lap swimmers use most. Freestyle ability is heavily dependent on breathing ease and efficiency. Stand in chest-deep water in the pool, facing the wall, hands on the pool edge. Bend over at the waist, breathe in and place your face in the water. Slowly but forcefully blow out the air in your lungs through your nose and mouth. Rotate your head as you exhale, tilting it to the side, toward the surface of the water. When your cheek and mouth emerge above water, inhale. Don't gasp or lift your head too high. Repeat the exercise, breathing to the left and then to the right side. Grab a kickboard between your hands and push off from the pool wall, face down. A kickboard is a rectangular piece of buoyant foam designed for swimming exercises. Inhale, and then place your face in the water and exhale. Rotate your head towards the surface, this time rotating your entire body in sync with it. Take a breath and then rotate back toward the opposite side, repeating the exercise. Minimize your head movements so that you just barely surface enough above the water to take a breath. Push off from the pool wall on your side, in a streamlined position. A streamlined side position means you stretch yourself out from head to toe, with your lower arm straight out in front of your body and your upper arm held at your side. Kick a slow flutter kick to keep yourself on the surface and moving steadily. Take a breath, and then blow out air into the water as you rotate your head until you face the bottom of the pool. Rotate your head back again and then take another breath. This exercise helps you keep your arm extended in a proper streamlined position while you breathe. Put a pull-buoy between your thighs and push off from the wall. A pull-buoy is a dumbbell-shaped foam float that keeps your legs afloat even if you do not kick. Limiting your motion to your upper body helps you to focus on timing your breathing. Pull backward with your stroke arm. Take a breath just as you finish your stroke and start your arm's return forward above the water. Start exhaling as you rotate your body to the other side. Alternate your breathing to either side, every three strokes. Repeat until you feel secure, and then swim without the buoy.